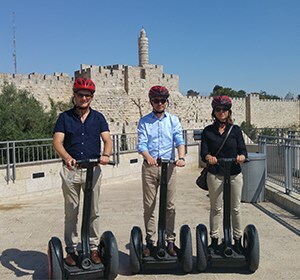 Is there a better way to get an up-close glimpse of Jerusalem's culture, art and heritage, than by going on a guided Segway tour and hover through the city sites? We're happy to offer you fun, high-quality guided tours on Segway, by bike or by foot. Get to know Jerusalem's hidden graffiti and street art on a fun guided Segway or bike tour. The tour starts at the entrance to the Karta Parking, just under Mamilla Mall. We will use a hidden path to climb up to Mamilla and Jaffa Gate, circling the Old City walls all the way to Safra Square and the New Gate, thus entering the city center and its hustling bustling live cafe's, bar's, workshops and small scenic alleys. In the city center we will encounter a small compound of unusual fascinating street art and graffiti display, just between Zion Square, Nahalat Shivaa, Mamila Mall and Safra Square. We will then continue riding on Jaffa Blvd. enjoying the beautiful street with its elegant buildings and shops, Jerusalem's Champs-Élysées. Entering the Mahane Yehuda Market at the end of Jaffa Blvd, we will tour the largest collection of graffiti in Jerusalem, created by Solomon, a 22 year old Chabad Yeshiva student, who started this project. We will see different paintings and portraits of famous Rabbis, Biblical scenes, founding fathers of the market and respected politicians. A wide array of eclectic and national/international graffiti that connects and completes the Mahane Yehuda vibe perfectly. both old and new. The success of any artist trying to do so, creates a far more rich urban scenery with unique and special city art. *Jerusalem street art tour is possible either on Segway, by bikes or by foot. For more information, please contact ZUZU Segway Tours. The tours are on behalf and under the responsibility of ZUZU. Enjoy a refreshing and charming tour at the famous Mahane Yehuda market. During the visit to the market we will encounter aromas, colors and the shouts of the Salesmen and women. We will enjoy unique tastes of the different stalls the market has to offer, from an amazing Hummus platter to a Georgian bakery, Halva and Tahini, Stands Turkish sweets and more. 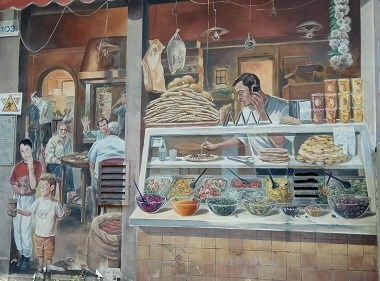 We'll hear stories about the people who established the market, visit hidden corners with street art and local culture, learn about the history and changes the market went through since it was established and, to conclude the tour, a visit to a famous shop with magical juices made of herbs and fruits, famous all over Israel. New urban creations in Jerusalem. Segway or bike tour to Mishkenot Shaananim - Yemin Moshe Neighborhoods, the First Station, Teddy Park and the famous artist lane, Hutzot Hyotzer. The tour starts at the entrance to the Karta Parking, just under Mamila Mall. We will ride up David Hamelech street and pass by the famous famous hotels of Waldorf Astoria, King David and the YMCA tower, viewing the unique architecture and hearing the stories behind the scenes of these well known Jerusalem monuments. We will enter then Mishenot Shaananim neighborhood and stop at an amazing lookout over the Old City's towers and turrets rising above its walls. Just next to our side will be the famous white windmill of Moshe Montefyori, recently renovated with the help of Dutch experts and generous donations. It stands as a reminder to the fascinating story of entrepreneurship, exiting the Old City walls after 3000 years of segregation and how Jerusalem's population grew in the last 150 years from 20,000 to 1 Million turning the city into the Megalopolis it is today. Following our guide we will continue through the Lions Fountain towards the First Station compound and the Rail Park, built over the original first railway crossing Jerusalem, one of the most important urban projects which changed the face of the city in the last decades. To conclude the tour we will visit the beautiful Teddy Park and the famous Hutzot Hayotzer compound, hosting Jerusalem's best artists, presenting their work in little galleries and shops. The tour ends at the entrance to the Karta Parking. *Jerusalem street art tour is possible either on Segway, Bikes or by foot.